I've never particularly cared for Gruul (either the color combination or the Guild), and for the longest time the only Red/Green Legendary creature I liked at all was Tana, the Bloodsower; who as I said in my Tana/Ikra deck tech works best with a partner. 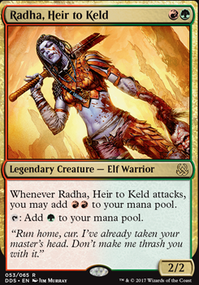 My antipathy for Gruul aside I always liked the original Radha, she wasn't what I wanted in a commander, cue Dominaria. Grand Warlord Radha intrigued me but it wasn't until a year after Dominaria's release that I decided I wanted to play her. My reason for deciding to go for her was a (at this point recent) Commander's Quarters video featuring her. That lengthy introduction out of the way, this deck is simple: step 1- Aggro, step 2- Mana, step 3- More Aggro, step 4- More Mana, step 5- Repeat. That's it, drop creatures with special abilities, turn sideways for value.